I've taken some pretty incredible trips, but one of the most memorable was my hiking adventure in Ireland almost ten years ago. It was my idea of a perfect vacation - days wandering through the rugged beauty of the Irish countryside, and evenings drinking Guinness and listening to music in small pubs. One of my favorite memories is of one evening in the tiny town of Annascaul on the Dingle Peninsula, sitting in a crowded pub that seemed to hold every resident of the village, with everyone from the busboy to my fellow hikers trading songs. Because in Ireland, everyone is a musician. 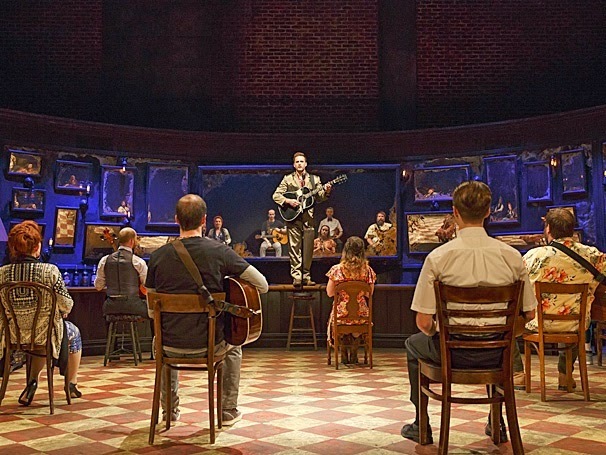 The musical Once (based on the 2007 indie movie of the same name, featuring music composed by its stars, Glen Hansard and Marketa Irglova) brings a small taste of that spirit to the Broadway (touring) stage. The stage is set up as an Irish pub, with audience members allowed on stage before the show and during intermission, where you can listen to music and even drink a Guinness (through a straw - OK that part's not authentically Irish). 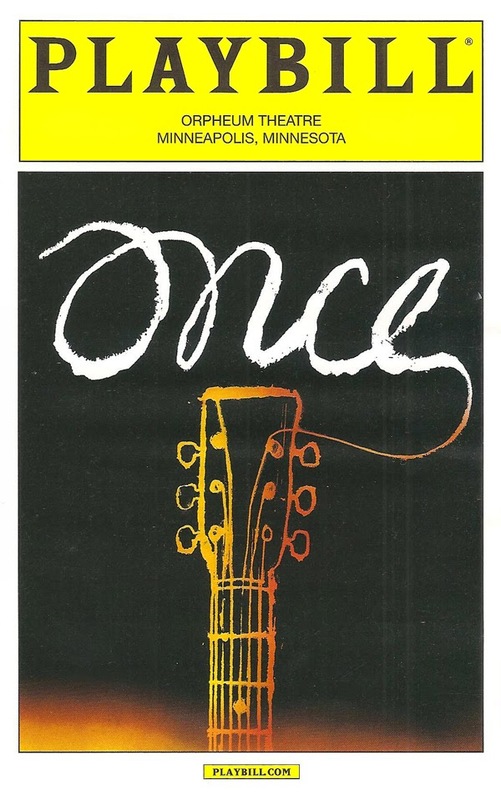 The musical Once is a refreshingly different type of Broadway musical (I actually think it's more like a play with music*), in that the music is more folky that Broadway scores normally are, with music performed by the cast, all of whom play one or more instruments. This eight-time Tony winner is a sweet, simple, soulful love story fueled by the raw power of Glen Hansard's music. I should also mention that Once is one of my favorite movies, and that Glen Hansard, whose music I first heard in that movie, has become my favorite musician (check out his brilliant first solo album Rhythm and Repose, released in 2012). Which on one hand makes me predisposed to love the musical Once, but on the other hand makes me critical of the adaptation and what has been changed from the beloved original, although I try to view the movie and the musical as two separate entities created for two very different artforms. When I saw it on Broadway two years ago,** I wrote: "The musical is different from the film; where the film is subtle and internal with much left unspoken, the music is more cutesy and external with things more obviously spelled out (sometimes literally). But the film is so sparse that I suppose they have to fill it out for a live audience. I think it's quite successful and well done; the magic of Once is retained on stage, if in a slightly different form." The first national tour, currently stopping at the Orpheum Theatre in Minneapolis, features a different cast but that same undeniable magic. The general plot of Once, both film and musical, is this: a street musician who works at his dad's vacuum repair shop has recently gone through a bad breakup and is disenchanted with life. He meets a young Czech immigrant woman who's full of life and encourages him to make music and get his girl back. In the movie, this encouragement is more subtle, but in the stage musical the girl is relentless in convincing the guy to move on (the characters have no names). They record a demo together of the guy's songs, and forge a deep and intimate connection through the music they make. But what I love about the movie, that thankfully they've kept in the musical, is that these are two people who meet and have an intense connection that profoundly changes the direction of each of their lives, and then they continue on different paths. In a Hollywood movie, they would end up together, but this seems much more real and poignant somehow. It's a true love story, but one that you don't often see on screen or stage. This quote by Albert Schweitzer reminds me of this show: "In everyone's life, at some time, our inner fire goes out. It is then burst into flame by an encounter with another human being. We should all be thankful for those people who rekindle the inner spirit." That's what these two people did - rekindle each other's inner spirit. As the guy, Stuart Ward has big shoes to fill - both those of Glen Hansard and Steve Kazee, who won a Tony for the role. And fill them he does, although in a different style than either of these predecessors. He possesses a gorgeous voice, more musical theater than folk-rock, a moody intensity, and great stage charisma. The character of the girl changed so much from movie to stage that all thoughts of Marketa Irglova are gone, but Cristin Milioti (aka the surprisingly short-lived "Mother") left a great impression. Dani DeWaal fills those shoes nicely in the quite tricky role of the girl, charming and sweet but not too perky. And when Stuart and Dani sing together, as on the Oscar-winning song "Falling Slowly," it's wondrous. The two are well supported and enhanced by ten wonderful actor/singer/musicians (and one adorable little girl). Standouts include Evan Harrington as the good-natured but tough music store owner, Donna Garner as the girl's strong and supportive mother, Raymond Bokhour as the guy's sweet Da, and Matt DeAngelis, providing comic relief and powerful percussion as Svec (you know you're a true musical theater geek when you recognize touring cast members, as I did Matt; I clearly remember him as Woof in another musical obsession of mine, Hair, and in American Idiot). As I mentioned, the set is a pub that never changes, with tables and chairs brought out to represent different settings. Through it all, most of the cast remains on stage, watching from the sidelines. Dingy mirrors surround the stage and offer other angles of the action. The movement and choreography is so beautiful, subtle and organic. There are no typical "dance numbers," just characters moving organically as the music moves them. Even the scene changes are beautifully and elegantly carried out, as not a moment is wasted. * My two criteria for differentiating a "musical" from a "play with music" are this: 1) in a musical, characters sing in character, and 2) in a musical, songs move the plot along, so that if you removed the songs, the plot would no longer make sense. In a play with music, removing the songs does not change the plot, although it will diminish the effectiveness and impact of the piece. In Once, all of the songs are sung in context (street musician, open mic at a pub, a recording session), characters don't break into a song and sing their thoughts and feelings. Hence I believe it's a play with music. The Tony eligibility committee obviously disagreed with me.